January came and went at 100mph, packed with amazing fundraising ideas and events, and much activity around planning some of the big THHN extravaganzas of 2017. So whether you’re involved in volunteering for THHN, putting on quirky fundraisers like picture auctions or charity yoga, or giving money, time, toys and enthusiasm, we want to salute you. It’s thanks to you that we are able to offer memory-making holidays to families who sorely need them. Let’s make 2017 even better than 2016! Calling all sporty primary schools! 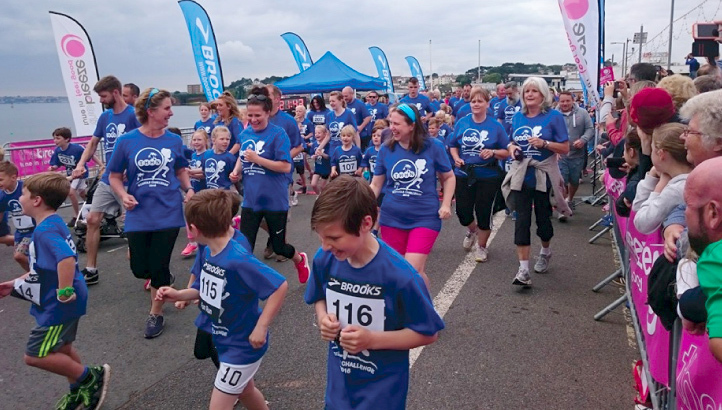 We’re hoping that primary schools will once again field their young runners for the THHN Schools Challenge at the Torbay Half Marathon, back for 2017. It allows children between the ages of 4 and 11 to take on their own Half Marathon Challenge by running a mile a week at school in the 12 weeks leading up to race day on Sunday, 25 June and then on the day of the Torbay Half Marathon itself running their final mile around Paignton Green to cross the finish line to cheers from the crowds gathered there. Each child gets an event T-shirt and Half Marathon Medal. It’s going to be a great atmosphere on the day and a great sporting challenge for young runners, so we’re calling on schools to get involved today. If you have a child at primary school, please beg the teachers to sign up now and return their entries to THHN by 10 March. Last year over 330 children from eight different schools took part. More information can be found at: www.thhn.co.uk or the THHN Memory Makers Children’s Shop in St Marychurch Precinct. A big thank you goes to the organisers of the Torbay Half Marathon for letting us stage this fantastic schools challenge. Yates Torquay have very generously chosen THHN as their charity of the year for 2017. Their first amazing gesture when they closed the old London Inn to refit it and turn it into Yates was to put up a lot of their amazing mirrors and pictures of historic Torbay for secret auction in aid of our charity. What a great way of putting unwanted items to good use. Thank you so much. A very big thank you to Katie Watson at Flow Studio, Torquay, who held a charity yoga session for runners in aid of THHN. Attendees included our very own THHN Runners. The class was designed to illustrate what an excellent complementary activity yoga is to running. Participants were asked to leave a donation to THHN and the evening raised £150. Thank you to everyone who went along. Paignton-based World Wide Academy (WWA) has chosen THHN as its charity of the year. They will be putting on fundraising events and activities at their dance academy, and a percentage of the profits from the sale of their merchandises will also be donated to THHN. 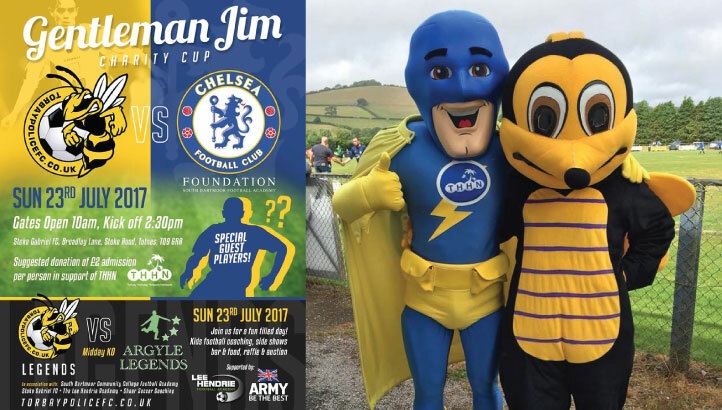 We’re giving you an early heads-up for the Gentleman Jim Charity Football Cup on Sunday 23 July 2017, which will once again be raising money for THHN. On the day there will be two matches: Torbay Police Legends vs Plymouth Argyle Legends, and Torbay Police vs Chelsea Foundation (SDCC), with the event taking place at Stoke Gabriel Football Club. Torbay Police are to be captained by ex-Aston Villa and England star Lee Hendrie, now of The Lee Hendrie Academy. Chelsea Foundation are also planning to field guest players. There will also be entertainment and activities throughout the day, including children’s coaching, climbing wall, face painting, bar, food, raffle and auction. Gates open at 10am. Last year the event raised £880 for THHN and even saw Memory Maker Man in goal and taking penalty shots against children before the match. A huge thank you to the organisers for choosing to raise funds for THHN again this year. Our very own fundraising manager Brian Lewis, who is also a director of THHN’s City to Sea marathon and ultramarathon, featured in January’s Men’s Running magazine. He told the story of his own amazing running journey, from a 19-stone couch potato to ultra runner and coach. The Run Torbay running group he set up a couple of years ago has raised over £1,700 for THHN, and has seen over 170 people sign up to the ten-week beginners’ course. We’re very proud of you, Brian. If you’re inspired by Brian’s story, why not set yourself your very own running challenge and enter THHN’s very own City to Sea 2017 on Sunday, 3 September? You have the choice of the marathon (which can also be walked) or the 34-mile ultramarathon challenge – both routes take in stunning scenery, beginning in Exeter and finishing at Babbacombe Downs, where a fabulous Family Fun Day will be taking place. Could you pursue the Pennywell Pursuit? If you fancy a shorter distance, consider the first ever Pennywell Pursuit, a 10k trail race and fun run on Sunday 30 April. It will be organised by Pennywell Farm and THHN, with £5 from every entry coming straight to THHN. The challenging route will run through the beautiful South Hams countryside and is all off road, taking runners across on private farm land and woodland, with the start and finish line at Pennywell Farm, near Buckfastleigh. There will also be the Pennywell Pursuit 1- mile fun run for all ages. We’d like to extend a big thank you to everyone at Copy Print and Design in Torquay, who asked people to donate toys for their 2016 Christmas appeal. There were some wonderful donations which will be given to THHN families when they come on their holidays over the next few months. We know the children will love them. Thank you too to everyone who donated toys. 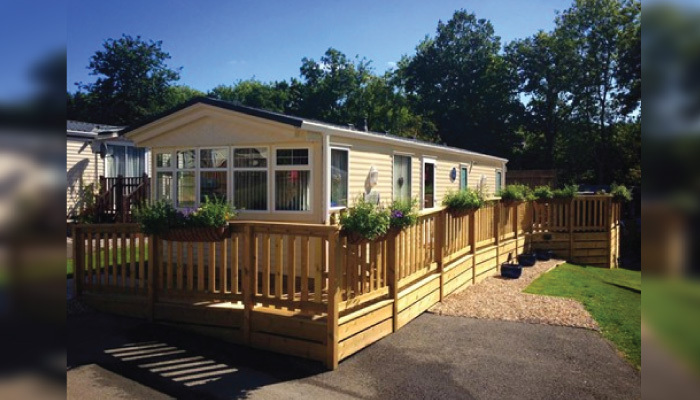 January saw our very first memory-making holiday of 2017, when THHN welcomed a family to its Memory Maker caravan. We expect it to be the first of many this year. A heartfelt thank you to our amazing business supporters Riverford, Halletts the Bakers, Luscombes Butchers of Torbay, Claire’s Cakes, D&H Fisheries and Project Linus UK, who all donated wonderful hampers and gifts for the family to enjoy.